Let’s define social skydiving. 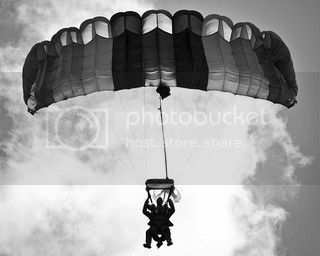 Social skydiving is the art of chatting and meeting strangers randomly in order to make a new friend, get a date, get over social anxiety, flirt with attractive people, or any other form of getting out of your social comfort zone. Being shy for many years of my life cost me many opportunities to interact socially. After all those years, I wanted to do a social experiment that allowed me to have something anyone would want: Choice. When it comes to meeting people through your social circle or a particular group (especially in college), the people are prone to be similar types of people. For example, imagine joining a Psychology club where all of the people in the group at Psychology majors. Nothing is wrong with that but I wanted variety and choice. I also wanted a challenge to allow me to take risks. This ended up fitting both of those needs. You’re going to mess up and that’s okay. This was the first time that I approached strangers with the intent of flirting with attractive women. Some approaches had women look at me strange. Others smiled when I started talking. A few of them were stunned by my confidence. A couple of them were mocking me by my awkwardness. The ups and downs of these approaches allowed me to take positive reactions in stride and the negative reactions without offense. It taught me to focus on a stable, content mood throughout the experience. I spend a few hours walking around chatting with women. Just like anything else, it takes practice to improve your social skills and flirting skills. Many of them lasted less than a minute. Others had a duration of over an hour. I met a wide variety of women studying many different things. I met girls in their 1st year and girls in their 5th year. I met some of them waiting around for a few minutes for the next class and others walking into town. Social skydiving doesn’t have to take that many hours of your day but it allows random encounters with people you wouldn’t have met otherwise. Even if you took 10 minutes to chat to someone you found attractive or interesting, it could end up making a major difference. I consider it a valuable skill that pushes you out of your comfort zone. The topic of creepiness would come up sooner or later. I have utmost empathy for people. I always made sure that the girl I approached had personal comfort and safety with the interaction. If she was getting fearful or she seemed like the type that didn’t like what I was doing, I would tell her it was nice meeting her and be on my way. If there was a major lull in the conversation, I would tell them that silence can be golden because both people are trying to figure out what to talk about. If we didn’t have much in common I would tell them it was nice meeting them and move on. I opened up and told some of them that I had social anxiety and I wanted to talk to strangers to improve my social skills. They smiled and accepted to talk to me for 5-10 minutes. There was also a few approaches where I didn’t state my purpose and it made it weird in the long run. I learned to state your intent. It doesn’t always have to be right away. I learned to state it eventually or risk hovering around without a purpose. Honest transparency delivered in a clear, confident tone eases the other person to start a conversation as well. My definition of success during these approaches was to actually do them. No matter how difficult the task seemed, I got joy out of just partaking in the task, regardless of result. It was my personal zen-like activity to calm me down. Success was knowing that I passed through my own personal fear each and every time I went up to an attractive stranger. Then I noticed that many of my regrets disappeared as well when I took a chance to chat with somebody I wanted to. Much of the time, it made them feel really good too because flirting is fun. The calm wave upon me had arrived. For the next couple of months, I’ll write about some of the more memorable approaches during this time and what you can learn from my experiences. If you liked this post, please subscribe to get quick updates. Hats off to you for getting out there and doing it, Matt. I know how intimidating it can be, but also how rewarding. Thanks for sharing your experience, and I look forward to reading more about he individual approaches.